Prime Minister Binyamin Netanyahu's full remarks at joint meeting with President Trump. "Mr. President, my dear friend Donald, you’ve shown consistently incredible support for Israel, for our right to self-defense. When we exercise that self-defense, you have never flinched. You have always been there, including today, and I thank you. Yesterday, a rocket was fired from Gaza deep inside Israel. It hit a home north of Tel Aviv. It wounded seven, including two small children, and miraculously no one was killed. Israel will not tolerate this. I will not tolerate this. And as we speak, as I told you, Mr. President, just now, Israel is responding forcefully to this wanton aggression. I have a simple message to Israel’s enemies: We will do whatever we must do to defend our people and defend our state. After this meeting, I will return home ahead of schedule to lead the people of Israel and the soldiers of Israel. But before I go, Mr. President, it was so kind of you to invite me to come here. It was so important for me to come here to the White House and to thank you. Mr. President, over the years, Israel has been blessed to have many friends who sat in the Oval Office, but Israel has never had a better friend than you. You show this time and again. You showed this when you withdrew from the disastrous nuclear deal with Iran. I remember in one of our first meetings, you said, “This is a horrible deal. I will leave it.” You said it; you did it. You showed it when you restored sanctions against a genocidal regime that seeks to destroy the one and only Jewish state. You said, “I will restore those sanctions.” You said it; and you did it. You showed that when you recognized Jerusalem as Israel’s capital and moved the American embassy there. And David is a tremendous ambassador. You said it; you did it. 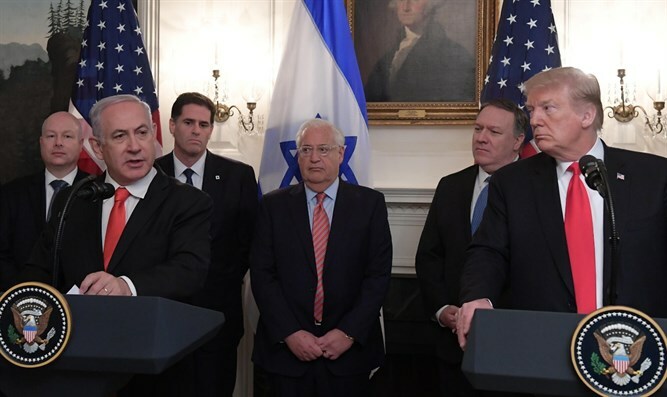 And you’ve shown it once again today, Mr. President, with your official proclamation recognizing Israel’s sovereignty over the Golan Heights. This is truly a historic day. For two decades, from 1948 to 1967, Syria rained deadly fire from the Golan Heights on Israel’s citizens below. A generation of Israeli children lived in constant danger. And then, in two glorious days in June 1967, the brave soldiers of Israel scaled those daunting heights and liberated the Golan. This has profound meanings for all Israelis and for me personally. One of those brave soldiers was my brother, who was wounded in battle three hours before the end of the war. And a few years later, as an officer in a special unit, I led my soldiers into a covert mission into Syria, and as we came back to the Golan, to Israel, we nearly froze to death in a blinding snow storm. Well, as you can see, I’m still here. But at that point, in 1967, Israel seized the high ground, which has since proven invaluable to our defense. Because in 1973, Syria launched a surprise attack against Israel, and those same Golan Heights proved to be, to enable us to absorb the initial attack. It was a horrific attack, and successfully counterattack the invading Syrian forces. Within three weeks, we were at the gates of Damascus. Outmanned, outgunned, our brave soldiers triumphed after one of the hardest-fought tank battles in our history. While Israel won those two wars, we would have to wait nearly half a century, until this moment here in this room, to translate our military victory into a diplomatic victory. And that is why, Mr. President, your decision to recognize Israel’s sovereignty on the Golan Heights is so historic. Your recognition is a two-fold act of historic justice. Israel won the Golan Heights in a just war of self-defense, and the Jewish people’s roots in the Golan go back thousands of years. In the long sweep of Jewish history, there have been a handful of proclamations by non-Jewish leaders on behalf of our people and our land: Cyrus the Great, the great Persian king; Lord Balfour; President Harry S. Truman; and President Donald J. Trump. And you, Mr. President—Mr. President, you’ve done it not once, but twice: with your bold proclamation on Jerusalem and with your bold proclamation today on the Golan. Your proclamation comes at a time when the Golan is more important than ever for our security, when Iran is trying to establish bases in Syria to strike at Israel. From across the border in Syria, Iran has launched drones into our airspace, missiles into our territory. Mr. President, just as Israel stood tall in 1967, just as it stood tall in 1973, Israel stands tall today. We hold the high ground and we shall never give it up. Mr. President, we have a saying in Israel. I’ll say it in Hebrew. It says "HaAm im haGolan". That means the people are with the Golan. But thanks to you, we now know that there are two peoples who stand with the Golan, the people of Israel and the people of America. So on behalf of all the people of Israel, thank you, President Trump. Thank you for your leadership, thank you for your friendship, and thank you for all you have done to make the alliance between America and Israel stronger and greater than ever. Thank you, Mr. President".